The Joomla Live Streaming edition is the easiest choice to setup and run the Live Streaming application on a Joomla website to brodcast live video online. 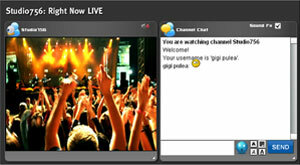 Users can publish live video channels from their webcams and online channels can be listed on site with the modules. Server side transcoding of webcam live video to iPhone / iPad is possible with compatible hosting that includes Wowza and FFMPEG with necessary codecs. Stream can also be published directy for iOS with external encoders. Channel view detects iPad/iPhone and shows the HTML5 HLS container. Froom joomla administrator interface fill rtmp path in component parameters from Components > VideoWhisper.com Live Streaming. 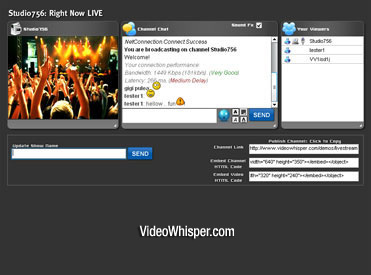 This usually has this form: rtmp://your-rtmp-host.com/videowhisper . We send you this if you host with us. Enable the modules from Extensions > Modules (joomla administrator interface). 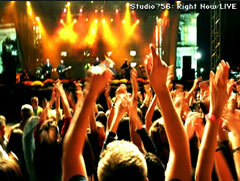 Enable Streaming Module to list live channels and broadcast link and Streams Module to show live channel snapshots. Edit skins, incons, sounds in components/com_videowhisperlivestreaming/templates/live . Edit component templates in components/com_videowhisperlivestreaming/views (see tpl folders): channelslist, channel, vw, logout . Edit logic in components/com_videowhisperlivestreaming/models/flash.php . Channel previews are saved as snapshots in components/com_videowhisperlivestreaming/snapshots as jpg images with channel names. Size matches broadcasting resolution. If enabled from settings, smaller thumbshots are also generated to list in live streams module. Joomla integration for this video streaming software is based on a joomla component and 2 joomla modules that can be used as needed. The joomla Streaming module lists active broadcaster channels & show names and a link to broadcast. If user is not logged a clickable message is shown to return to the website and login. The joomla Streams module shows live show previews and information like duration, current status. Component provides interfaces to broadcast, watch and discuss video, embed video, browse live channel lists with image preview. If you're happy or not with this application and want to leave a public feedback, you can rate and submit a review for the Live Streaming Component on Joomla Extensions Directory.